You will now get the template wizard asking for details. Fill in the details to tell CSVI what kind of template you want it to be. After filling in the details click on Select source. Select the source if its import operation or Destination for export. Click on Select options and fill in all the options needed. Click on Select fields. 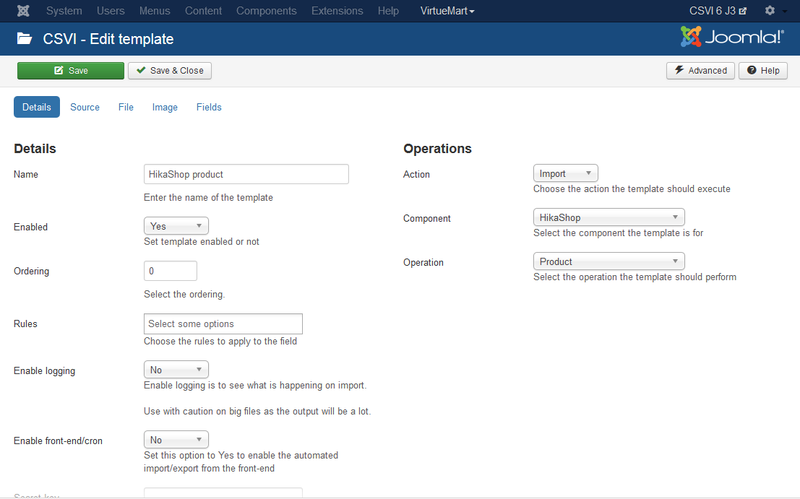 By default there is no option in import template to add fields so move on to last step of finalizing. The fields are optional for import templates because it is possible to use the column headers in a file as fields. For export, you have an button Edit template fields to add required fields as it is important to tell CSVI which fields you are trying to export. Add fields and moved on to last step of finalizing. Click close and save the template. The advanced button will show or hide extra options available for this operation, by default only the basic options are shown. Click on the Advanced button to show the extra options, click again to hide the extra options. The help button will show you a description of each field below the field. Clicking the Help button will show the help information, click again and the help information will be hidden. Read article How to edit a template to know how to change the settings of saved template.